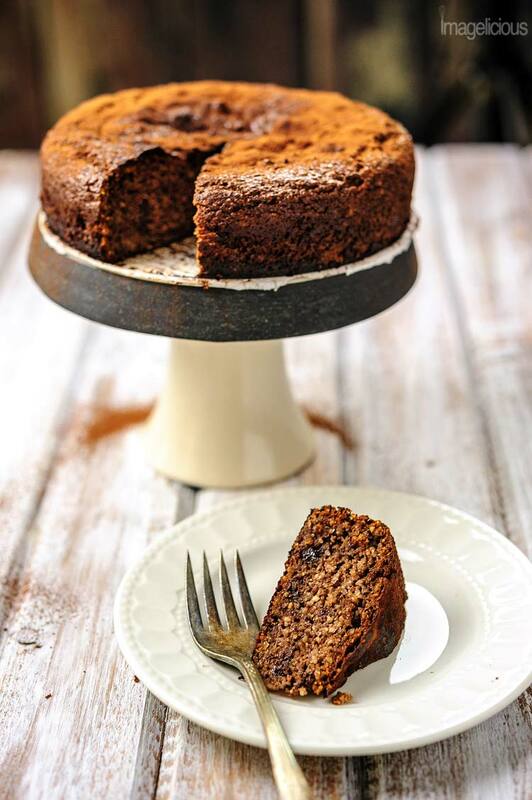 This delicious Gluten-free Almond Ricotta Chocolate Cake is perfect for any special occasion. It’s moist, dense, flavourful, and healthy. It’s filled with healthy ricotta and almonds, has very little sugar and no oil or butter. It’s also naturally Gluten-Free. Do you have a snack drawer? You know the one where you keep all those left over Halloween candy, boxes of chocolates that someone brings over, candy that you get on sale, gum, mints, crackers. I have a big drawer like that, full of delicious and not so healthy snacks. One of my favourite things about Holiday season is the Christmas stocking that I get from my parents-in-law. They fill it with all the crunchy, minty, sticky, sweet, and salty foods that we would not buy on our own. There are usually boxes of Pocky sticks (pizza flavour is my favourite), bags of dried salted squid that we have to eat hiding in the bathroom since our cats go absolutely crazy for the smell, and other snacks, many of them Japanese since my mother in law is from Japan. Then there’s usually a huge box of Russian chocolates that I get in December every year from my step aunt and uncle. And I really mean huge, it’s about 5 or 6 pounds of delicious individually wrapped wafer chocolates. I also photograph for a local bakery that keeps sending me their delicious product of cookies and cupcakes a few times a year (or a few times a month as it happened this January). It’s no wonder that I have not been baking much recently. It’s actually a puzzle how I still am able to fit in my clothes. So, past few months weren’t filled with sticky and sweet and spicy and warm aromas of winter baking. I still baked, but very little. I made my traditional Gingerbread Cheesecake for Christmas dinner. I made Chocolate Crackle Cookies when I had a few people over. I baked Brown Butter Peanut Butter and Jam Cookies for my husband’s work dinner. And I made an Almond Cake from dairygoodness.ca for my New Year’s Eve dinner. The cake was good. Really good. Still it could have had a few modifications. I found it a bit too oily, so I removed all the butter from the recipe. There’s enough natural oil in almonds to keep the cake moist. I felt it was too sweet and reduced the sugar a little bit. 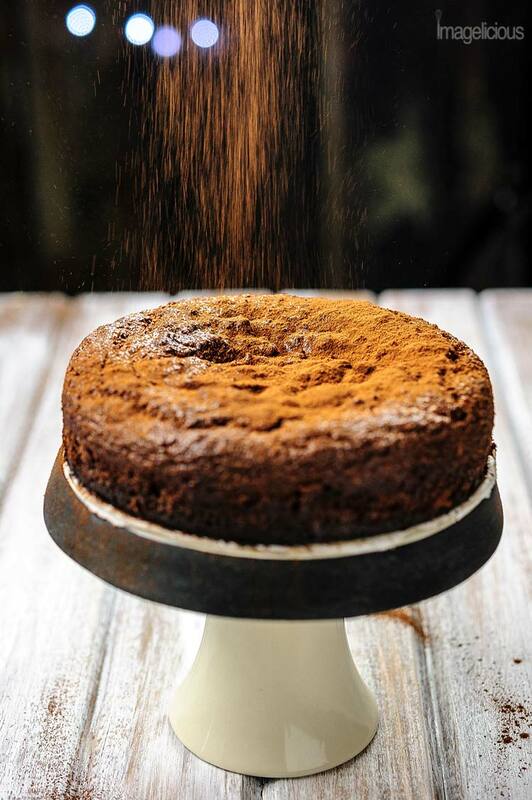 I added some cocoa powder for even more chocolate flavour and then poured a splash of my absolutely favourite secret ingredient that makes any dessert that much special. What is it? Here you go: Pure Orange Oil! I add a splash of it to almost any chocolate dessert that I make and everyone asks me about it. If you can’t find this oil (and I highly recommend you do as it lasts for a long time and is just, oh, so amazing), then add some orange zest. (on a side note: that same brand’s lemon oil did not work for me at all unfortunately). 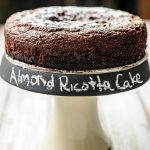 With all the changes that I made to this Gluten-free Almond Ricotta Cake, it actually became healthy, well, almost healthy. The cake has almonds, ricotta, egg, milk or cream, some chocolate, a bit of cocoa, and a little bit of sugar. If this is not healthy, then what is? It’s so fast and easy, that you can make it any time. If you don’t believe me that it’s easy, watch the video of me making the cake! 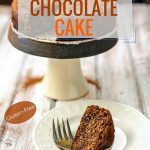 The Gluten-free Almond Ricotta Chocolate Cake is really easy to make as there’s no creaming or whipping or separating or chilling or folding required. The batter comes together in a cinch; all the ingredients just need to be mixed well with a spatula and then baked. It’s perfect for a Valentine’s Day dinner or any special occasion. Yes, it’s that easy, you really only need to combine all the ingredients and mix. It’s another true one-bowl recipe! Do you need butter in this almond cake? Original recipe had melted butter mixed into melted chocolate. It made the most luscious and silky chocolate sauce that mixed in beautifully into the batter. Now that I removed butter, melted chocolate doesn’t mix well into the ricotta and sort of seizes a bit, which is totally fine! 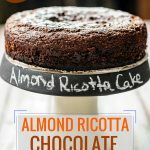 It’s still mixed into the Gluten-Free Almond Ricotta Chocolate Cake and when you take bites there are pieces of chocolate that melt on your tongue. I added a little bit of cocoa powder to colour the batter. However, if you really are worried about that chocolate not fully mixing in, then just add a tablespoon of melted butter or oil to melted chocolate. I personally don’t think it’s needed, but it wouldn’t hurt. It will, however, make the almond cake a little bit more oily. 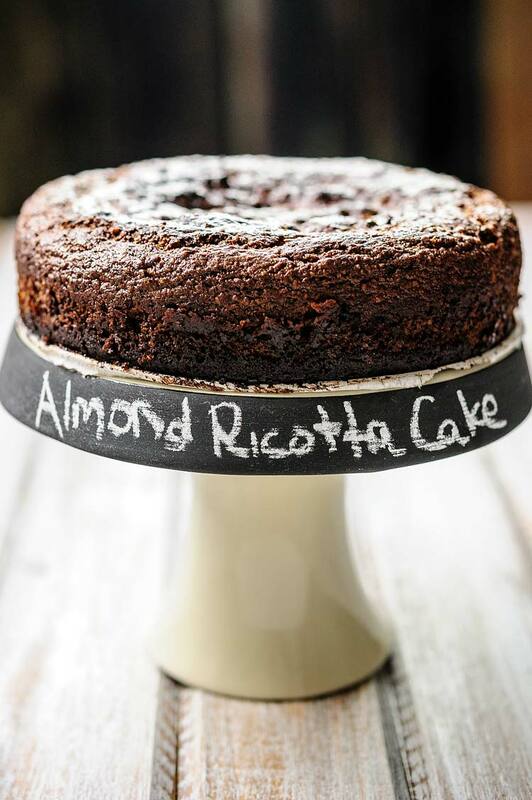 How sweet is the Gluten-Free Almond Ricotta Chocolate Cake? Another note I’d like to make is on the amount of sugar – original recipe had little sugar and I reduced it even more. I don’t like desserts that are too sweet and for this cake this amount of sweetness is just right for me. My best friend who had a chance to test taste the Gluten-free Almond Ricotta Chocolate Cake agreed, but if you have a sweeter tooth, then increase sugar a little bit. This is a small almond cake and it is perfect for a mid-week celebration or treat. I use 5″ springform pan to bake it. This size pan is not very common but I use it surprisingly relatively regularly and I recommend having it in your collection. Made with ground almonds and ricotta this cake doesn’t have a traditional smooth crumb, it’s sort of grainy, which is not the most appetizing description, but it’s accurate. If you ever had any almond desserts you’ll know what I mean by that. I actually absolutely love almond baking and almond texture, and to me it’s the beauty of the cake. But when I looked up the original recipe I read a few comments that people complained about the texture. In a large bowl whisk together the ricotta and egg. Add milk (or cream) and sugar and mix well. Add melted chocolate and mix to incorporate it into the batter. If the melted chocolate seizes and hardens, don’t worry, just mix to distribute it evenly. Add ground almonds and baking powder. Mix well. Butter or oil 5-inch pan, sprinkle with cocoa powder and shake to cover it with cocoa. Pour the batter into the pan and bake at 375F for about 50 minutes. Test with a dry toothpick to make sure that it’s baked through. Let cool in the pan. This is important as the cake will crumble if not cooled. Once cooled, sprinkle with more cocoa powder and serve. Can this recipe be doubled to make a larger cake? Looks great! I was thinking of using some ground hazelnuts I have but they’re not super finely chopped like almond flour, would that work?